Choosing the right toys for your little one can be a lot of fun. One trip to the local toy store and you will be transported back to a time when you were a little boy or girl. You may be looking for toys and games that you enjoyed when you were younger, or you may be looking for the newest in the toy industry. Many new parents may be flooded with hand-me-downs and presents, which can make the task of keeping your baby safe that more challenging. 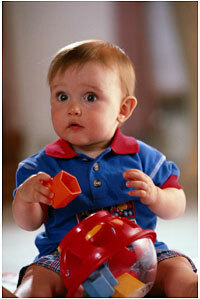 It is important to inspect each and every toy and anticipate future problems or health hazards. 1. Always follow all manufacturers’ age recommendations. Some toys have small parts that can cause choking hazards, so make sure to read the toy’s packaging. 2. Check the toy for sharp edges. A good toy should be unbreakable and not pose as a choking hazard. 3. Size it up. Use a toilet paper roll as a guide post for all toys. If it can fit through the tube, your baby shouldn’t be allowed to play with it because it could cause choking. 4. Check for small parts such as eyes, wheels, or buttons that can be pulled loose. They should be strong enough to withstand chewing- or they should be removed all together. 6. Strings should be no longer than 7 inches in length..
7. Be weary of hand-me-down toys. Many have not been tested for safety, so there may be hidden problems or hazards. Painted toys made before 1978 may contain dangerous levels of lead and should be discarded immediately. 8. Stuffed animals- particularly those that are given away or sold at fairs or in vending machines could be accidents waiting to happen. Check them thoroughly for loose parts, sharp edges, and other small parts.